Entering the season, there wasn't much of a question that Notre Dame's schedule was no breeze. Meetings with Clemson, Georgia Tech, USC and Texas all appeared like they would be significant challenges for Brian Kelly's team to overcome. And yet, this road game against Temple was conveniently forgotten, though it is clear it will be no easy win. The Owls enter this game ranked 21st, undefeated and playing in front of a home crowd that will host College GameDay hours earlier. 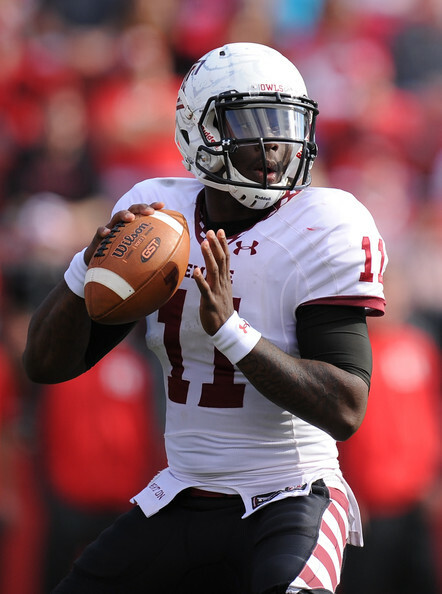 At 7-0, the Owls have used an effective offense, led by quarterback P.J. Walker and running back Jahad Thomas (822 yards), along with a suffocating defense to have major success. Plus, they haven't just been beating up on weak Group of Five schools, they dominated Penn State in their opener and stifled Cincinnati a week later. Meanwhile, ND has had an interesting road to this game. The early injury to QB Malik Zaire seemed that it would drown the Fighting Irish but they have played well under the leadership of backup DeShone Kizer, with their only loss in a close one to an excellent Clemson team on the road. Their running back situation has also surprised after presumed starter Tarean Folston went down for the year. Senior C.J. Prosise has been on fire lately, and has proven he has great patience mixed with wonderful vision. The Irish also have Will Fuller to work with on the outside, along with a healthy Corey Robinson, a big physical threat in the red zone. It will be interesting to see how the Irish offense plays against the Owls' defense. Temple has been wonderful against the run all season, so we know Kizer will have to make some big plays. But, Temple has not played an offensive line with the talent that Notre Dame possesses and it is sure to be an intriguing battle throughout the game. Defensively, Notre Dame continues to play well, led by linebacker Jaylon Smith and playmaking cornerback KeiVarae Russell. Walker isn't known for his huge arm but he has shown a methodical approach to moving the ball this season, and Thomas is always sure to break open runs, and big plays have killed the Irish all year. Temple recognizes the opportunity here: a win puts them at 8-0, with wins over Penn State and ND, and on the inside track to become the Group of Five team promised a New Year's Six (and maybe, just maybe, a Playoff berth?). They will play incredibly hard, but I actually have confidence in this Irish offense. Kizer and Prosise are playing great and this offense has proven it can move the ball against strong defenses. Two weeks into the year, who could have predicted how big of a game this would turn out to be? Stanford was coming off a loss to Northwestern in which they managed just six points, while Washington State had just lost to lowly FCS school Portland State. Yet, here we are, in a matchup that could decide the Pac-12 North. The Cougars have been flaming hot since a slow start, now sitting at 5-2 with a pretty big win over Oregon to their credit. Quarterback Luke Falk has been on fire under Mike Leach's air raid system, already throwing for 2,885 yards and 26 touchdowns. He has a number of big-time threats to distribute the ball to, including Gabe Marks and sneaky River Cracraft. Stanford has long had the identity of a smashmouth, defensive-orientated football team. While their offense has been a revelation this season, that is still their strength. That defense, particularly the secondary, will have to step up in a big way to tame the Cougs. Even if it doesn't completely stop Washington State though, the Stanford offense should put them in a good position. Senior quarterback Kevin Hogan entered the year with questions about his job security and has responded with the best year of his career, by far. He has shown a lot of confidence in the pocket and has been throwing down the field more aggressively than ever. It also helps that he has a possible Heisman candidate helping him out in the backfield. Christian McCaffrey also had a slow start to the year before exploding on to the scene these past couple of games. McCaffrey isn't insanely fast, but he is shifty and he can always bust open up big plays, whether it be as a runner or a receiver out of the backfield. Washington State's defense has long been a problem under Leach and while it has shown fight this season, it could still be in store for a whipping. The Cougars just simply don't have the size up front to match Stanford's bulky offensive line and the Cardinal are better than anyone at punishing defenses with power. This is as big of an opportunity for WSU as it is for Temple against Notre Dame. The Cougars have taken steps under Leach, but have yet to really have a truly defining win. Beating the eighth-ranked Cardinal in front of the home folks would certainly qualify as one. This is a weird game; it could turn out to be a classic Pac-12 shootout, or Stanford could turn it into a slugfest. Either way, the way the Cardinal are playing they have to be my pick, even in a scary late road game on Halloween night. For so long, the ACC Atlantic has always had the big games. The past few years, it seems Clemson and Florida State have always dominated the conference's headlines, and once more they are heading towards a huge clash in just a few weeks. But, the conference's Coastal division is playing great football this season, particularly these two teams, who are a combined 12-2. First year head coach Pat Narduzzi has been a major reason for the Panthers huge turnaround. Even without stud running back James Conner, Pitt has found success behind Tennessee transfer Nate Peterman at QB, backup running back Qadree Ollison and a strong defense. Peterman, Ollison and wide receiver Tyler Boyd will have their work out for them in this one though; this isn't the pushover UNC defense of the past few years. Former Auburn head coach Gene Chizik has done a wonderful job with the defensive unit and has them playing incredibly hard and incredibly disciplined. Boyd presents an interesting challenge though; the huge receiver is a likely NFL first-rounder and he has incredibly soft hands. While that should put some major pressure on the Tar Heels' defense, they should find ways to force the ball away from Boyd. On offense, North Carolina has gotten a strong year from veteran QB Marquise Williams, but more importantly, a big year from young back Elijah Hood. A former big-time recruit, Hood is starting to come into his own in Chapel Hill, with 646 yards and eight touchdowns to this point. Narduzzi, who was the defensive coordinator at Michigan State before arriving at Pitt, has a strong, powerful front seven and a mind that knows how to stop great backs, he did it all too often at MSU. Though, he will also have to account for Quinshad Davis at receiver, along with an interesting dynamic, do-it-all Ryan Switzer. The junior receiver can make plays there, but his strength is as a returner. If Pittsburgh doesn't completely slow him down, he could be in store for some big plays. In a game that is sure to be tight, letting extra yards slip away on special teams, is a problem. This is another interesting game, and a treat on a Thursday night. The winner keeps their undefeated conference mark and puts their foot in the door of the ACC Championship game. Both teams should run the ball and play good defense. That makes quarterback play very important, and I'll go with the more experienced option in Williams. Even on the road, UNC should be able to come away with a win.